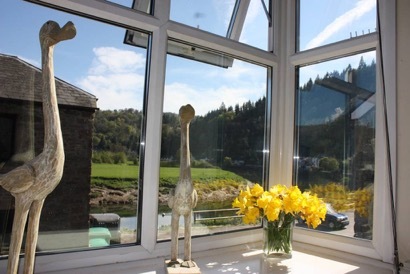 A beautiful self-catering cottage a few minutes stroll from the historic Tintern Abbey. Sleeps 5, pets welcome. Overlooking the magnificent River Wye in the heart of the historic Tintern is this former Coach House. A few minutes stroll from Tintern Abbey and within in walking distance of numerous pubs, eateries and a craft centre. •	This border territory is marked by stunning scenery and has brooding castles (Chepstow, Raglan) and market towns (Abergavenny, Monmouth) to explore, with excellent walking in Offa’s Dyke, in the Forest of Dean and along the river bank of the Wye. •	The area is wonderful for walking and touring and is easily reached all year round, with facilities for fishing, riding, cycling, and canoeing readily available. •	Chepstow Racecourse, The Big Pit mining museum and many excellent golf courses (including the Celtic Manor host to the Ryder Cup in 2010) are near by. •	Birdlife is abundant (RSPB Symonds Yat). Also within easy walking distance are many eating places. •	Wooden spiral staircase to 1st floor. 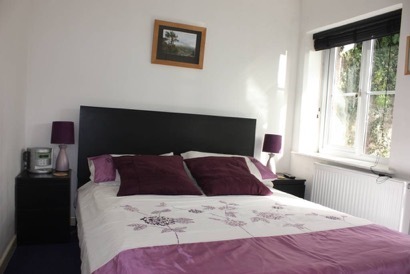 •	Double Bedroom with additional Single Bed. •	Bathroom with Shower over Bath, WC and Wash Basin. •	Full Oil Central Heating incl. •	CD \ Cassette Player. •	Larder Fridge with icebox. •	Washer \ Dryer Washing Machine. •	Gravelled south facing Courtyard garden fully enclosed by walls with a wooden balcony. •	Garden furniture \ Barbeque. •	2 allocated parking spaces (further free parking available). For further details please visit our website or give us a call. The Coach House, Monmouth Road, Tintern, Monmouthshire, NP16 6SG.